Effective Dec. 16, the Department of Public Safety (DPS) office will close at 10 p.m. The office will be closed on all University holidays. Beginning Jan. 7, 2007, the DPS office will close at midnight. These changes will be carried on through June 30, 2007. At that time, a review of the effectiveness of these changes will take place, and a determination to continue or discontinue these changes will be made. As a general guideline, the following will apply through June 30, 2007: the DPS office will close at midnight when school is in session; the DPS office will close at 10 p.m. during University break periods and summer sessions; and the DPS office will be closed on all University holidays and other days as announced by DPS administration. These changes will not effect coverage by the DPS police officer staff. The DPS will still have a police officer on duty 24 hours a day, throughout the calendar year. The changes will only effect the hours in which a receptionist is working. In accordance with these changes, all phone calls made to the DPS office after regular office hours will be forwarded to the Central Dispatch. Sevits Farms, a family-run farm in the Greentop, Mo., area, has begun to do its part to support environmentally conscious efforts in the Kirksville community by collecting used cooking oil from local businesses, including Sodexho Food Services on the Truman campus. Sevits Farms grease collection service provides business properties with a metal oil collection container, free of charge, in exchange for allowing Sevits Farms to recycle the used cooking grease for use as a feed additive and biodiesel fuel on its horse, cow, goat and crop enterprise. Sevits Farms seeks to utilize a more environmentally and economically friendly fuel alternative, as well as to save business owners both money and time in not having to employ a local waste pick-up service. Sevits Farms will remove the grease from the containers on a monthly basis, free of charge. Lora Cunningham, assistant to the director of Sodexho, said Sodexho chose to use Sevits Farms for the oil recycling because their services met Sodexho’s needs. Last year Sodexho spent about $40 per building per pick up with four pick-up stations, Cunningham said. The number of pick-up stations has been reduced to three this year due to the closing of Missouri Hall for renovation. Contact Jeremy at 341.5041 or Sara at 341.5774 for more information on the Sevits Farms recycled grease pick-up service. Truman State University will be nominating up to two seniors or recent graduates for the Graduate Scholarship Program sponsored by the Jack Kent Cooke Foundation. The Jack Kent Cooke Foundation Graduate Scholarship Program is one of the largest and most competitive scholarship programs in the nation. The Foundation will award the graduate scholarships in early summer 2007 for use during the 2007-2008 academic year, and will renew each award in subsequent years based on performance. Scholarships can be awarded for as much as $300,000 (up to $50,000 per year for up to six years). Applicants must have an excellent academic record and significant unmet financial need. Further information can be found by visiting the Jack Kent Cooke Foundation Web site at http://www.jackkentcookefoundation.org. To apply, contact Doris Snyder in the Graduate Office, at dsnyder@truman.edu. The campus deadline to apply is Feb. 1, 2007. Drawings by Julia Jarrett show pottery from an excavation site in Egypt. Sara Orel, associate professor of art, is looking for your help putting together an assignment for her JINS class next semester. The class is Cultural Crossroads: Cairo and she is hoping to provide students with an opportunity to experience one of the things that archaeologists in Egypt do with great regularity - sorting pottery and developing a typology that allows scholars to get an idea of trade connections, eating habits, and cooking techniques. She asks all faculty and staff to keep an eye open for ceramic dishes, flower pots, cups, etc., that they either want to get rid of or ones that are broken already and which will go to a good (but not a functional) use. If you have any of these or just random sherds of pottery floating around your house, or office, please drop them off at her office (OP 2221) or at the Division of Fine Arts mailroom. She is hoping to get a wide variety of types. She already has a couple of coffee mugs, so standard coffee mugs are probably not needed in great quantities, but she would love teacups, and porcelain mugs, for example. She would even like to have used flower pots. Of course, rinsing off the dirt before sending them to Orel would be much appreciated. Contact Orel at 785.4419 or via e-mail orel@truman.edu with any questions. Seeking to do its part to promote environmental consciousness within the community, Hy-Vee grocery store has teamed up with a campus environmental organization to implement more environmentally friendly business practices at its Kirksville location. As part of the Environmental Campus Organization’s (ECO) Bring Your Own Bag (BYOB) campaign, which took place on campus the week of Oct. 18-21, Hy-Vee has announced that it now supports the reuse of bags. Hy-Vee will offer a five cent deduction to customers that bring in cloth or plastic bags to put their purchases in for current transactions. Customers must tell cashiers that they are planning to use reusable bags at the time of purchase, in order to receive the deduction. The 2006-2007 season of Truman’s Kohlenberg Lyceum Series is proud to present “Amahl and the Night Visitors,” a ballet performance by the James Sewell Ballet, at 7:30 p.m. Dec. 12 in Baldwin Auditorium. “Amahl and the Night Visitors” is a one-act opera by Gian Carlo Menotti, originally performed for television in 1951. The play follows the life of a crippled boy named Amahl and his mother who live in poverty among the shepherds. Amahl and his mother are visited by the Three Kings who are on their way to Bethlehem to visit the baby Jesus. Amahl’s life is forever changed because of their visit. The visual-spatial movements of American Sign Language (ASL) are incorporated into the performance as part of the choreography, along with classical ballet, to illustrate this story. By using ASL and several other movement styles to provide a movement vocabulary for the performers’ hands, the James Sewell Ballet dramatizes the story to bring it to life in this unique ballet performance. A limited number of tickets for “Amahl and the Night Visitors” will be available beginning Dec. 5. Seating is general admission. Admission is free for students, faculty and staff with their University ID. Students may pick up tickets at the Student Activities Board Office, third floor of the Student Union Building. Faculty and staff may pick up tickets at the Center for Student Involvement, lower level of the Student Union Building. The University requests that all patrons be seated five minutes prior to the performance. The University reserves the right to fill all seats, reserved and general admission, five minutes before the time of performance stated on the ticket. No refunds will be given. 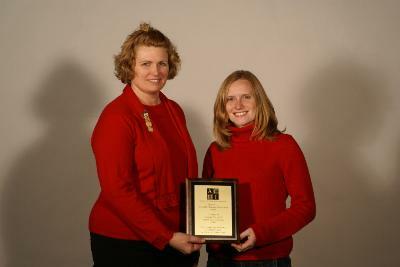 Robin Taylor (left) presents Bonnie Treichel (right) with the Association of College Unions International (ACUI) award Nov. 30. Taylor nominated Treichel for the award. Bonnie Treichel, a senior business administration and political science double major from Turney, Mo., was the recent recipient of the Association of College Unions International (ACUI) Region 11 Outstanding Student Achievement Award, given at the 2006 Super “Region 21” (Region 10 and 11) Conference, on the campus of Creighton University in Omaha, Neb., Oct. 26-28. She won the award for her exemplary performance in college union or student activities work. The Truman community is invited to attend a retirement reception for Ronald Knight, professor of mathematics. Knight, who has been an educator at Truman since 1965, will retire at the end of the fall 2006 semester. The Truman community is invited to attend a retirement reception for Kay Clapp, professor of education. Clapp will retire at the end of the fall 2006 semester after 28 years of service to Truman. The Truman community is invited to attend a reception for Rebecca McClanahan, assistant professor of nursing. 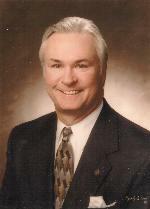 McClanahan will be leaving at the end of the fall 2006 semester after 31 years of service to Truman. The Truman community is invited to attend a retirement reception for Doug Winicker, campus planner. Winicker will retire at the end of the fall 2006 semester after 30 years of service to Truman. The Truman community is invited to attend a retirement reception for Joyce McVay, business office student accounts supervisor. McVay will retire at the end of December after 29 years of service to Truman. Admission to each performance is free. Contact Todd Coulter at tcoulter@truman.edu for at 785.4519 for more information. Those who cannot make the event should stop by the Advancement Office in McClain Hall 100, to pick up their free Truman alumni T-shirt. There will be performances by Unique Ensemble, Sweet Nothings and True Men. There will also be free hot chocolate, cappuccino and cookies for those who attend. Detailed information will be published in the Dec. 12 issue of the Truman Today. Any Truman faculty or staff member who is at least 10 pounds overweight and not currently engaging in regular physical activity is encouraged to join. If you are interested in learning more about the program or would like to sign up, contact Jennifer Hurst at 665.4464 or jhurst@truman.edu. Truman will host the 12th annual conference in honor of Women’s History Month, March 22-24, 2007. Members of the Truman and Kirksville communities are invited to submit abstracts. Abstracts need to include a return address, phone number and e-mail address. The deadline to submit is Jan. 29, 2007. Contact Linda Seidel at lseidel@truman.edu for more information, or to submit an abstract. John Ishiyama, professor of political science; Marijke Breuning, associate professor of political science; and Linda Lopez of the National Science Foundation; had their article “A Century of Continuity and (Little) Change in the Undergraduate Political Science Curriculum” published in the November issue of the American Political Science Review. Matthew Tornatore, associate professor of foreign languages and linguistics, had his review of Pasquale Natella’s latest book, “La Parola ‘Mafia’” (Citta di Castello: Olschki Editore, Biblioteca dell’ “Archivium Romanicum”), published in the most recent volume of Forum Italicum: A Journal of Italian Studies. Modified Supplemental Retirement Plan Information for faculty and staff is available online at http://hr.truman.edu/benefits/msrp/. Immediate opening: Upward Bound (Kirk Building 220) has employment positions open for a student services coordinator II and for a tutor/adviser. Both positions entail mentoring and tutoring area high school students as they prepare for postsecondary education. More information is available on the Web at http://ub.truman.edu or by calling 785.4244. The Center for Student Involvement (CSI) is now accepting applications for the SERVE Center (scholarship and work-study positions only), for the spring 2007 semester. SERVE Center applications are due to the CSI by 4 p.m. Dec. 5. Interviews will take place Dec. 6 and 7. Contact Amy Currier, program adviser for the CSI, at acurrier@truman.edu for more information. There will be an Assessment Colloquium from noon-1 p.m. Dec. 5 in Ryle Hall’s private dining room. Jason Miller, associate professor of mathematics; Jennifer Thompson, STEP program coordinator; and Sue Pieper, assessment specialist; will be discussing a method of assessing journaling that economizes faculty labor while still capturing the insights that are the reason for assigning journaling. This assessment has been undertaken in conjunction with the NSF STEP grant that funds undergraduate research. Lunch from the Ryle Hall cafeteria is $5. Psychology capstone presentations will be given from 1-4 p.m. Dec. 5 in the Student Union Building Activities Room. Senior psychology students will be giving poster presentations of their original research. The event is open to the University community. Contact Karen Smith at ksmith@truman.edu or at 785.6033 for more information. Truman’s chapter of Psi Chi, the national psychology honor fraternity, will be hosting its Memory Movie Night from 7 p.m. to midnight Dec. 5 in the Baldwin Hall Little Theatre (176). A viewing and discussion of the films “Memento” and “The Eternal Sunshine of the Spotless Mind,” will take place. Contact Ben Greenberg at brg543@truman.edu for more information. There will be an informational meeting about the Clayton, Mo., Internship Option at 4 p.m. Dec. 6 in the Violette Hall Education Division Conference Room (2351). Those interested in this excellent internship opportunity are invited to attend. Several of the components of the internship, including professional development, will be discussed. Contact Wendy Miner at 785.6074 or at wsm@truman.edu for more information. There will be a brief informational meeting for students interested in taking part in the three credit hour summer study abroad course in Düsseldorf, Germany, at 5 p.m. Dec. 6 in Baldwin Hall 348. The course will take place from July 30-Aug. 19, 2007. There will be a Folklore Colloquium from 5-7 p.m. Dec. 6 in Baldwin Hall 272B. Jennifer Creer, a long-time student of Mormon culture, will be speaking at the colloquium. She has an M.A. from Truman and experience as an English teacher and assistant director of research at A.T. Still University. She is co-editor of Inkstains, an online journal which she considers the 21st century equivalent of an 18th century coffee house. The Marathoner’s Group will have an informational meeting at 9:30 p.m. Dec. 6 and 7 in the Centennial Hall Main Lounge. Those interested in running a full or half marathon are invited to attend. Contact Chris Copley at cjc117@truman.edu for more information. Psi Chi will be hosting a pre-finals study and relaxation day from 10:30 a.m. to 4 p.m. Dec. 7 in Baldwin Hall 156. Psychology majors, those interested in psychology or students who are looking for a place to study in a relaxing atmosphere are invited to attend. There will be board games, cards and other activities for students who need a study break. Contact Ben Greenberg at brg543@truman.edu for more information. The final installment of the Viewpoints Series will be “Viewpoints: Global Warming” at 8 p.m. Dec. 7 in the West Campus Suites Multipurpose Room. Students and professors will debate the most controversial issues of our time. The event is sponsored by ResLife. Contact Sam Hodge at srh436@truman.edu for more information. The Society of Middle Eastern Dance (USMED) will have its Holiday Show from 7-9 p.m. Dec. 8 in the Student Union Building Activities Room. A bellydance show with a mini bellydance lesson will be conducted, and those who attend will have the opportunity to take pictures with Santa. There will be guest performances by Sweet Nothings and The Society of Dance Art’s (TSODA) Latin dancers. Refreshments will be served. Contact Ashley Tomten at TrumanUSMED@gmail.com for more information. Franklin Street Singers will have its fall concert from 8-9:30 p.m. Dec. 8 in Baldwin Auditorium. The performance is sponsored by the Division of Fine Arts. There is no cost to attend. The Kirksville Annual Holiday Bird Count will begin at 6:30 a.m. Dec. 9 in Magruder Hall 2018. Participants, who do not need to be experienced bird watchers, will count all the birds encountered within 7.5 miles of downtown Kirksville. Results of this and comparable counts in other locations are used to assess changes in avian abundance and the health of the environment. The Chariton Valley Audubon Society will treat participants to a continental breakfast. For more information, contact Pete Goldman at 785.4632 or pgoldman@truman.edu. CIAO Italian Club will have its Italian Club Breakfast at 10:30 a.m. Dec. 9 at the University Club. Admission to the meal is $2 and open to all students, faculty and staff. Tickets for the meal can be obtained by contacting Stacey Walker at sdw408@truman.edu. The University Orchestra Concert will take place at 8 p.m. Dec. 9 in Baldwin Auditorium. Contact Sam McClure at smcclure@truman.edu or at 785.4434 for more information. Deadline for submissions to The Monitor, the University’s alternative newspaper, is Dec. 9. Poetry submissions should be sent to aHugeManatee@gmail.com, and all other submissions should be sent to monitortrm@hotmail.com.